This week's Less Is More challenge is to make a one-layer card inspired by a film. 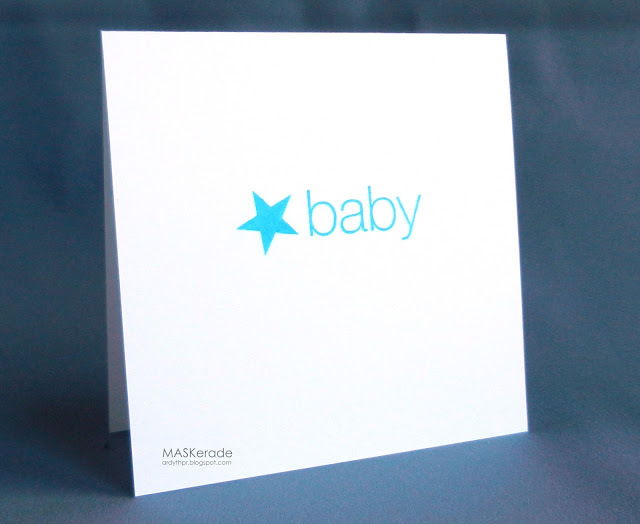 1) It's not that well-known film 'Blue Star Baby' (thanks to my husband for that suggestion). 4) The famous line I was going for here was "No one puts Baby in the corner"
I used an old Lizzie Anne Designs sentiment. Genius, Ardy! You have all of us using the artistic side of our brains AND both the other sides, too! (What?) You are the cleverest! Ha! I love that movie line...it is one that we quote quite often in our house. Fabulous CAS card! And blue star baby sounded like such a good film - I'm disappointed now ;-) Genius interpretation of the theme! Only you, Ardyth, only you! Always SO excited to see what you come up with! I wonder if this is the first card ever that was inspired by Dirty Dancing ?!? Funny how men are so literal :) Very clever take on the theme, and of course it would make a fab baby card. Dirty Dancing - one of my absolute favorites! Oh, to be able to dance like that! Dirty Dancing! What a wonderful movie and your card is amazing. I love that line too. So fun. Clever! I was trying to think of how I could represent a movie, and still up with a card that was actually usable. This is good. I'll have to think about it some more, though I'm not sure I'll have time. perfect cas as always ardyth !! LOL! Love it! Absolute genius!